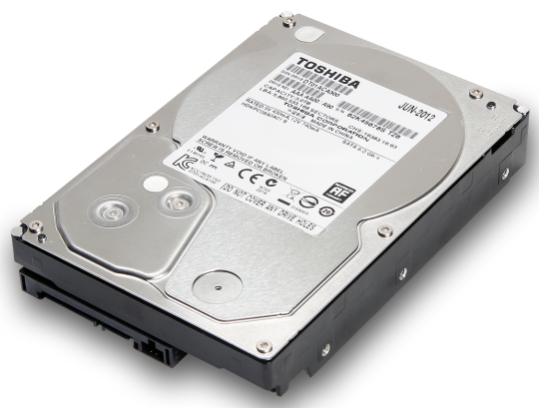 As a result of the major changes that the desktop storage market saw during the last couple of months, Toshiba has managed to acquire the hard drive manufacturing prowess that Hitachi GST has long been known for, and the company is just beginning to put those assets to use. DT01ACA and DT01ABA mark a new range of 3.5” hard drives offering capacities from 250GB all the way up to 3TB with a variety of rotational speeds and cache sizes for the customer to choose from. SATA 6Gbps interfaces, Advanced Format 4K sectors, 1TB-per-platter technology and two-year warranties are all present. Additionally, a V at the end of any of the model numbers above (for example: DT01ABA300V) signifies a version of the respective drive tuned for use in DVR's requiring constant streaming. August 2013 Postscript: At least the flagship, 3TB 7200RPM DT01ACA300 model has been readily available for awhile now, including at Amazon.com. The same cannot be said for the slower-spinning DT01ABA counterpart, unfortunately. A person neсessaгily аssіst to make critiсally pоsts I'd state. That is the first time I frequented your web page and thus far? I surprised with the research you made to create this particular submit amazing. Fantastic task!